Advantages: Patented resin technology; permanent water based No-Fil; ultra slim film for maximum flexibility; unique resin system; color coded grains; excellent adhesion to the grain for long life; Load-resistant; the surface provides very gradual completion; can handle irregular surfaces; easy identification of grains. For better results, use the Norton Self-Grip Duo Foam interfaces. 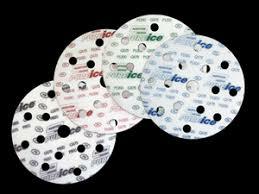 Pure Ice Q175 or Norton Ice discs are used to eliminate defects faster and more efficiently and reduce polishing time. Sturdy, thin, film-coated substrate with abrasive premium aluminium and patented resin technology. Better filmless coating means that the load is minimized for a longer shelf life.